It's safe to say we all owe a little gratitude to the first person who dared to marry the poppy seed and lemons in a dessert. It's almost perfection. I have no idea why poppy seeds bring so much to the table (literally), but they add a delightful crunch to these zesty little cakes. Lemon desserts have always been a favorite of mine, but I may have taken my citrus love a little too far this time. This recipe takes candied lemon wheels and bakes them right into the cake. 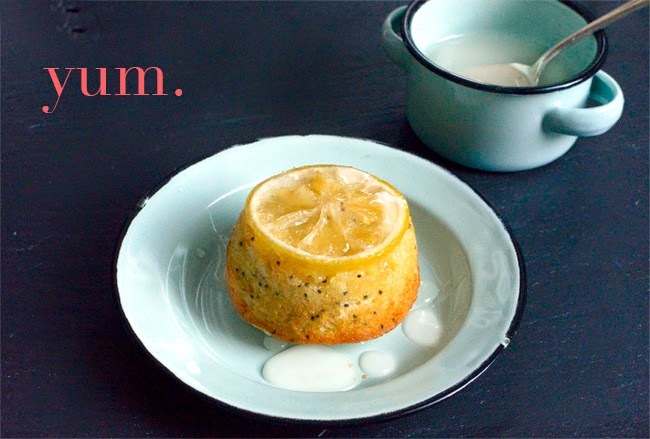 Once the cakes cool, flip them over to reveal the lemon wheel. 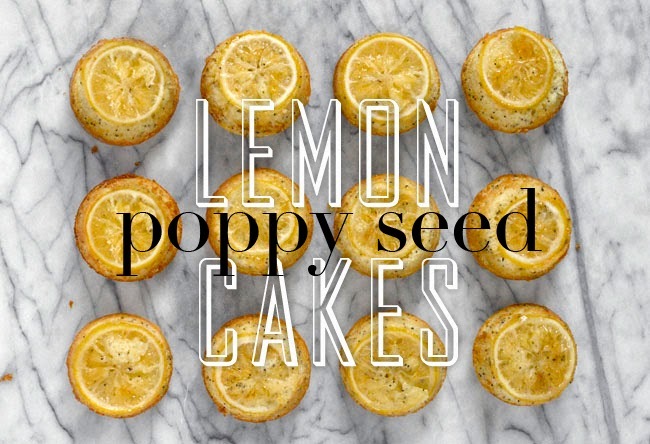 It's a new take on the traditional lemon poppy seed cake, usually taking shape in a bunt or loaf pan. 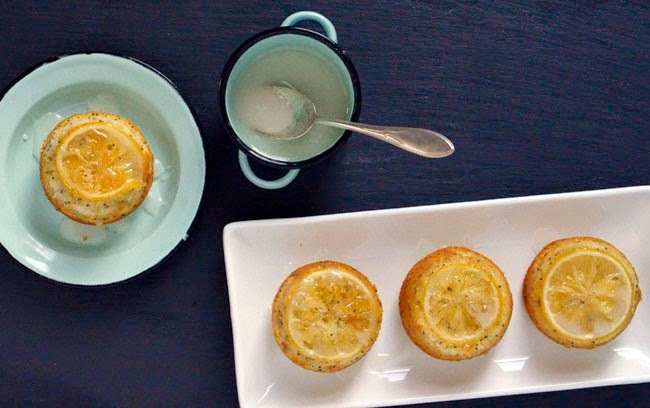 These individual cakes are baked in a cupcake tin, but they're topped with a subtle lemon glaze instead of a super-sweet buttercream frosting. Bake them for a tea party, baby shower, brunch, or...for no reason at all. They're just that good. Beware, these small cakes are the perfect match for small hands. 1. 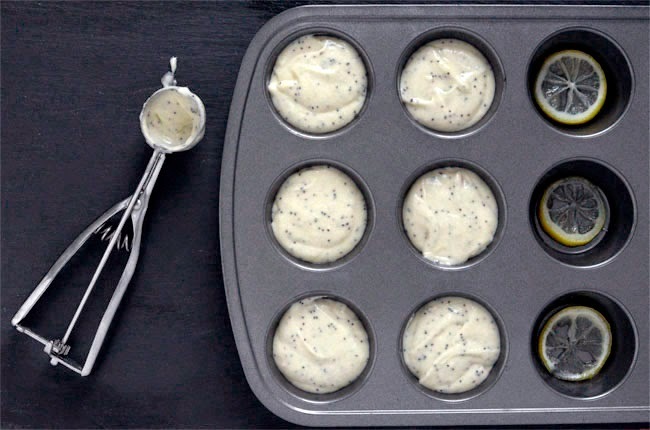 Preheat the oven to 350°F and grease a 12-cup muffin tin. 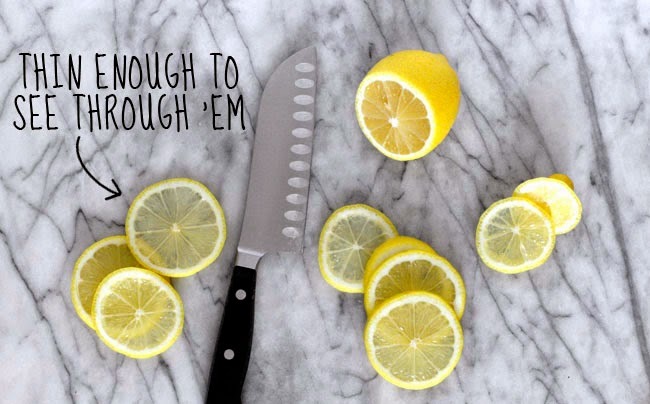 Using a sharp knife, thinly slice one of the lemons into 12 very thin slices and remove any seeds. Bring the water and 1 cup of the sugar to a boil in a saucepan. Once all the sugar has dissolved, reduce the heat to low, add lemon slices and simmer for 15 minutes. 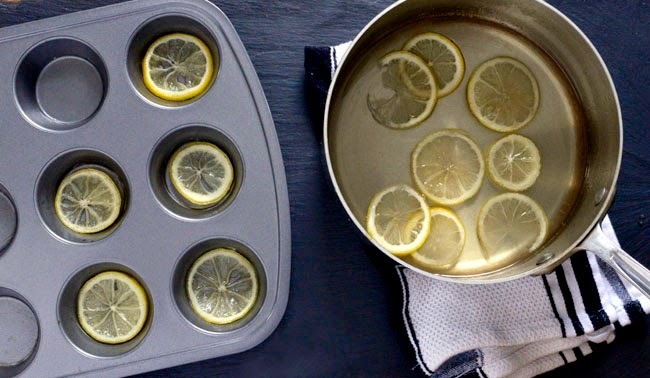 Turn off the heat and use tongs to carefully place one lemon wheel in each muffin tin. Keep about 1/4 cup of the lemon syrup to make a glaze for the cakes. 2. Whisk together the flour, baking powder, and salt in a bowl and set aside. Zest and juice the remaining lemon. 3. In the bowl of a stand mixer fitted with the paddle attachment, beat the butter and remaining cup of sugar until light and fluffy. Add the eggs, one at a time, beating until just incorporated, then add the vanilla, lemon zest and juice. 4. 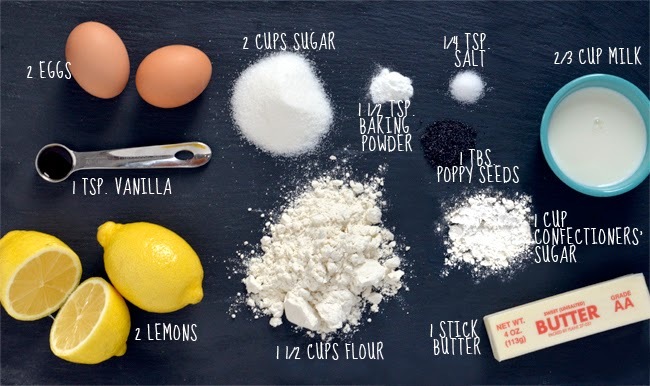 With the mixer on low, add the flour mixture to the butter-sugar mixture, alternating with the milk, until the batter is completely incorporated. Mix in the poppy seeds. Spoon the batter into the muffin tin, filling each cup about 3/4 full. Bake for 15 minutes or until a toothpick inserted in the center of a cupcake comes out clean. Let cool, then run a knife around each cup to loosen up the cakes. Invert the cakes onto a serving platter so the lemon slices face up. 5. Combine the confectioners' sugar and 1/4 cup lemon syrup in a small bowl. Stir until glaze reaches desired consistency, adding more syrup if needed. Drizzle each cake with the glaze and enjoy! Candied lemons can be made in advance. Just keep them refrigerated in an airtight container. Yummy, my favorite...Thanks for sharing this recipe. 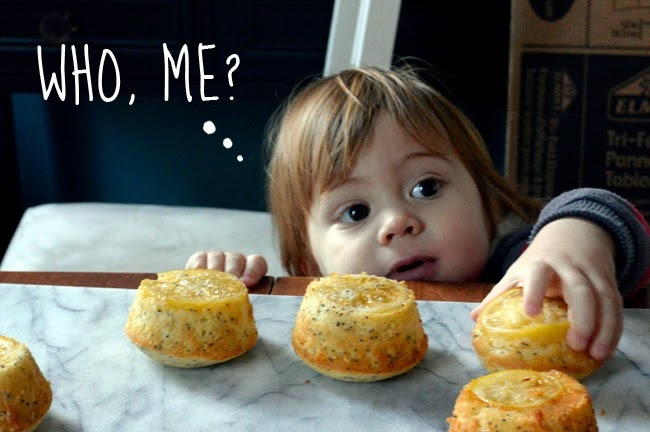 Nolan is so cute and this recipe looks delicious! !